This is our seventh consecutive year that we are offering an international concert Cycle focused on early keyboard instruments such as the harpsichord, the spinet, the virginal, the muselaar, the fortepiano, and the historic organ. Sugested by many of the people who attended the formers editions, the Cycle will be supported by a $20 Contribution Bonus (argentine pesos = USD 7) for most of the concerts. Like last year, we added the chance to support the Cycle as Bnefactor or Protector, giving them admision free for two people to all events and the mention of them in printed programs, and an enhanced mention or advertisement for Sponsors. One of the main experts on this remarcable player visit Buenos Aires to tell us interesting aspects over the life and work of Glenn Gould. 32 Variations in C minor by L. van Beethoven. 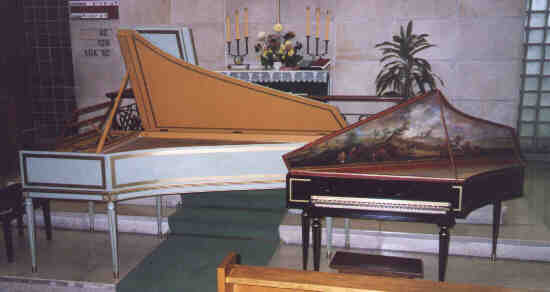 French baroque harpsichord after Henri Hemsch (París, 1736), maker: Jorge González (Bs. Aires, 1996), thanks to harpsichord player Hélène Dauphin. Georg Friedrich Händel (1685- 1759). Orquesta Juvenil de Buenos Aires, cond. Alejandro Beraldi. Chambonnières, Elisabeth Jacquet, Frescobaldi, Froberger, Storace among others.